Many people feel that they have no say over what development takes place in their community, but Village Design Statements offer a constructive solution. Local communities have a unique appreciation and understanding of their own place, and a Village Design Statement is based on this knowledge. It describes the qualities that residents value in their village and its surroundings. Several hundred English communities have completed Design Statements to date, with Cottenham being one of the first. A Village Design Statement sets out clear and simple guidance for the design of all development in a village, based on its character. It is an advisory document produced by the village community, not by the planning authority. It will not stop change from happening, but it can help affect how any new building fits in to the village. Village Design Statements are intended to influence the operation of the statutory planning system, so that new development is in harmony with its setting and makes a positive contribution to the immediate environment. A Design Statement was written by Cottenham residents so that local knowledge, views and ideas may contribute to the growth and prosperity of the village, and to the high quality of its environment. A wide public consultation exercise was carried out, and the Design Statement was adopted as Supplementary Planning Guidance by South Cambridgeshire District Council on 19 May 1994. Over the following years, both the village and the planning framework within which the document sits have evolved, with the result that the original Design Statement became less relevant than when it was first written. To ensure that the Design Statement remained effective the Cottenham Village Design Group carried out the process of updating it during 2007. 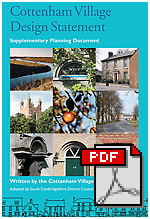 Following extensive public participation the revised Cottenham Village Design Statement was finally adopted as a Supplementary Planning Document by the District Council on 14 November 2007.